FOSITAN RF-600D 18 SMD LED Macro Ring Flash Light specially designed to use in the field of macroshot, scientific research, medical and personal photography in a very close distance shooting. It can provide continuous and stable semi light or full right to meet higher photograph needs. 2. Consist of 18 pieces ultra-bright LED, higher luminance and lower static power consumption. 4. High-quality LED light close to natural light, seven levels of luminance status to meet higher photograph needs. 5. With 1/4'' standard screw hole connector, this RF-600D ring flash can be mounted on a camera as photography light. 7. Eight diameters of adapter rings for alternative use 49mm, 52mm, 55mm, 58mm, 62mm, 67mm, 72mm, 77mm. 8. 4 colors of flash diffusers for alternative use orange, blue, oyster white, and transparent. 2.Before power on, please Long Press the ON/OFF button for 3 to 5 seconds. ULTRA COMPATIBILITY: Includes 4 Diffusers (Clear, Frosted, Blue, & Amber) and 8 Adapter Rings (49-77mm), will fit 49, 52, 55, 58, 62, 67, 72, 77mm Lenses. For Canon 750D, 760D, T6i, T6s, 7D Mark 2, T2i, T3i, T4i, T5i, 550D, 600D, 650D, 700D; Nikon D500, D5500, D750, D7100, D7200, D800, D800E, D810; Sony A6300, A7 II, A7R II, A7, A7R. 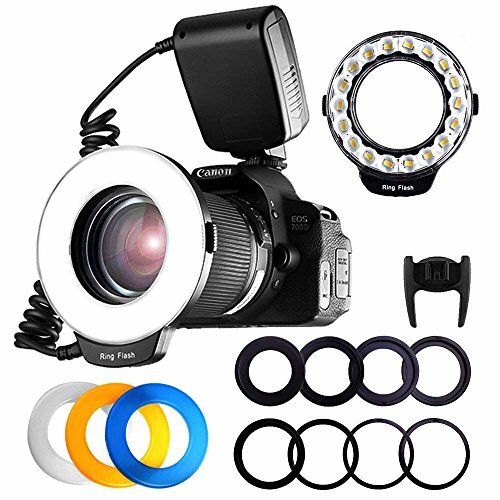 WHAT YOU GET: 1 x Macro Ring Flash, 1 x Power Control with LCD Display, 4 x Flash Diffusers, 8 x Adapter Rings(49, 52, 55, 58, 62, 67, 72, 77mm). Fositan 90 Days worry-free refund warranty and 24h life time friendly customer service. If you have any questions about this product by FOSITAN, contact us by completing and submitting the form below. If you are looking for a specif part number, please include it with your message.